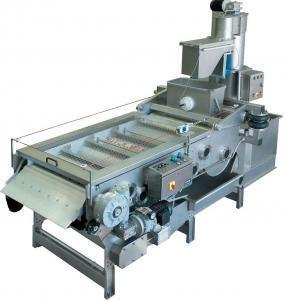 The automatic Single Belt Press is the ideal machine for fruit processing. Designed for the extraction of juice from produce such as apples, pears, quinces, carrots (etc. 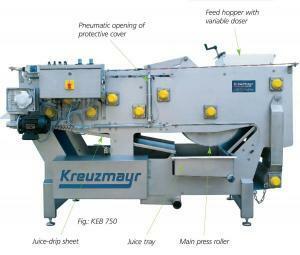 ); the fruit will be washed in a Kreuzmayr Washer / elevator / grinder machine (KWEM 1000 / 3000 / 5500) transporting it up to the centrifugal crusher. The fruit pulp (mash) is transported onto the moving press-belt. An automatic control prevents the pulp in-feed hopper from over filling. 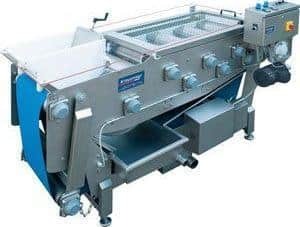 Stone fruit like cherries, plums, apricots or peaches need to have their stones removed with a De-stoning machine (KEP 650 / 1000 / 1500) in order to produce a fragment free pulp ready for belt pressing. The pulped mash is conveyed via the Washing-Pulping Mill or using a Mash Pump into the press In-feed hopper. The pulp is dispensed across the main pressing roller and between the belt to start the initial juice extraction. This pulp will be progressively squeezed to the maximum over a series of additional rollers and mash deflector blades to achieve an optimum juice yield of up to 75%. At the exit of the press, the pomace (mash) will be automatically scraped from the belt. A high pressure water jet cleaning device continually removes any remaining pulp particles from the press-belt, so that the belt is cleaned and ready to continue its pressing cycle. The SINGLE BELT PRESSES are delivered “ready to operate”. After installing, leveling and connecting to the power supply and pressurized air supply, the plant is ready to start pressing. In order to adapt the SINGLE BELT PRESS to the different working conditions (different fruits and vegetables) the belt speed and pressure can be easily modified by the operator to suit the product condition. The machine is simple to clean.